It’s all systems go as Statistician–General and head of Statistics South Africa (Stats SA), Mr Risenga Maluleke, this morning led a delegation of Stats SA fieldworkers to collect data at a farm in Bapsfontein in the East Rand for the Census of Commercial Agriculture (CoCA). About 600 fieldworkers wearing Stats SA branded gear, across the country are currently collecting data from farmers in order to count the number of commercial farmers, size of farms, variety of crops in different geographic areas, and irrigation usage among other variables. This data will assist to measure commercial farming output as well as to determine the types of farming and identify challenges in the sector. This will also measure the level of employment in the agriculture. “CoCA will assist the country to measure the level of food security in the country and also guide investment and planning in the agriculture sector. South Africa has a long history of conducting these censuses, with the first one conducted in 1918 and the results published in 1919. This is the third CoCA in post-apartheid South Africa with the first conducted in 2002 and another one in 2007”, said Maluleke. 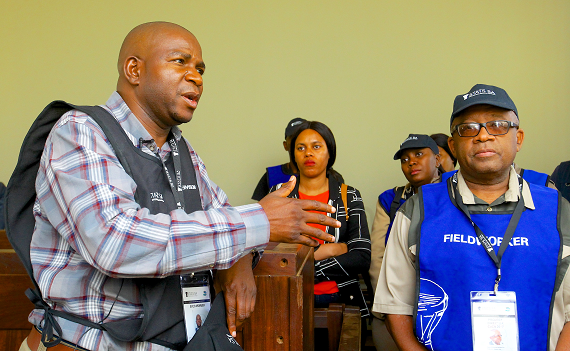 The farm visit was preceded by a briefing at the Welbekend police station where Maluleke briefed the station commander and alerted police about the presence of Stats SA fieldworkers in the area from 15th October to June 2019. In welcoming the Stats SA delegation, the famer pointed out that he has been responding to Stats SA questionnaires as he strongly believes that the data is needed to aid management of commercial farming. “We have been providing food to the South African population for many years and farming is important to ensure that we are able to meet the demands of the growing population. There is nothing sinister about the census as it will provide much needed data in the sector”, said the farmer who also indicated that he has been farming for the past 20 years. The United Nations body, Food and Agricultural Organisation (FAO) recommends that country’s conduct a census of commercial agriculture every ten years. The agricultural census will cover commercial farmers, which are farms producing for income or profit. According to the Statistics Act (Act No. 6 of 1999) compels Stats SA to maintain confidentiality of data collected through any form of survey conducted by the organisation. The information provided is strictly confidential and the results are to be presented in aggregate form only, which is also in line with Principle 6 of the United Nations (UN) Fundamental Principles of Official Statistics. If in doubt, farmers are encouraged to contact Stats SA to verify the legitimacy of fieldworkers who can be identified by their branded gear and may also call the toll free number 0800 212 169.